The family and I packed up and drove to Destin, Florida, over the weekend for our annual beach trip. We're relaxing, soaking in the sun, and spending some much-needed quality time together. Even though I'm on vacation, I have some fun stuff planned for the blog this week...a little Show-and-Tell tomorrow, some fashion on Wednesday,more of a home tour you've been asking about for a LONG time on Thursday, and my Friday Favorites! You don't want to miss it! Jealous--that looks like fun!!! Enjoy your vacation!! Miss you already friend! I hope you're having so much fun!! We leave for FL tomorrow...how funny!!! Altho, we will be at Disney until Sunday, then we will drive over to Destin for the week. I can't wait to relax on the beach!!! I hope you & your family have a great trip!!!! When in Destin we love to eat at The Back Porch & McGuire's Irish Pub! The Backporch is our favorite!!! Mcguires Irish Pub is hands down the best in Destin! Drive to Seaside!! You'll be glad you did!! Stinky's Fish Camp on 30a in Santa Rosa. It is hands down my favorite restaurant at the beach! We love McGuires Irish Pub, Capt. Dave's and Louisiana Lagniappe!! Yes to Louisiana Lagniappe! It's kind of a hidden gem, but it has amazing food with a gorgeous view! If you have been there before I am sure you know the family/kid friendly Fudpucker's!! We love it! For an adult/date dinner we love Ruth's Chris Steakhouse!! So jealous!! 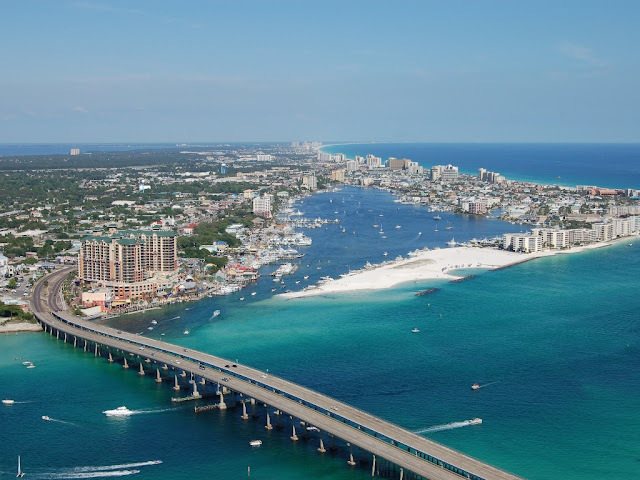 Enjoy beautiful Destin! Have fun! Destin has been a favorite for years! The Surf Hut just opened & is great! The fish tacos are soooo good! Hope you all are having a great vacation & making lots of memories! Dewey's. Get the stuffed broiled shrimp. Thank me later! Ha. We just went to SanDestin spring break. The Backporch and Pompano Joes were our favorites. The Backporch and Pompano Joes are our favorites. Have fun! The Back Porch is a FAVE of ours! It is awesome!! We like Graffiti's and the Red Bar in Grayton Beach. We just returned from WaterColor a few weeks ago. We love to eat at Wine World and Great Southern Cafe in Seaside. We also drove to Destin for the day to do the Buccaneer Pirate Cruise and had dinner at Harry Ts. We thought it was great. Enjoy your vacation! ONLY THE ORIGINAL DEWEY DESTINS.......ON THE PIER! I love Destin so much!!!! The Donut Hole has the BEST breakfast ever. I miss their bacon. Have a great vacation! We always go to The Crab Trap, The Donut Hole, and Brewster's for ice cream! Lillie's Q...call early in the morning to reserve the banana pudding (they only make 12 a day and run out quick). Donut Hole - I think that's the name of it...they have all sorts of food. Go to Boshamps and have the Snapper Destin. It was featured in Southern Living and for a very good reason. It's my favorite meal anywhere!!! Have fun!